With Euro 2016 just around the corner, adidas have been re-innovating a number of their team shirts. Read on to find out the FOOTY.COM verdict! Euro 2016 is not far away and the kits have started to roll out thick and fast. Adidas has been very proactive in releasing their kits for the tournament and possibly their most radical redesign to date. They have moved the stripes from the arms to the sides, a bold move and one that people really are loving. Here is our favourites from the new Euro 2016 kits! 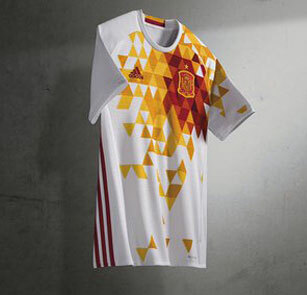 The new Spain Away Kit is going to be a cult classic, notable because of the rather bold and unique all-over pattern surrounding the badge. With shades of red, yellow and orange are striking to look at and definitely make a statement. Teamed with white shorts and socks it is a very fresh look for Spain and one that they hope will see them retain their title as European Champions. Zlatan and co will have the crowd thinking, "who are these cool customer's?" Zlatan will like this, adidas has gone away from a traditional kit here with a dark blue and grey design. The pattern somewhat similar to the current grey Real Madrid away shirt. A three colours block of greys have been used to give this an almost training shirt vibe. 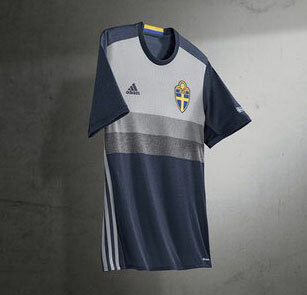 Accompanied with dark blue shorts and socks it really is a change for Sweden but adidas have created a wonderful kit here. Red Devils making a statement on their way to the Euro's. 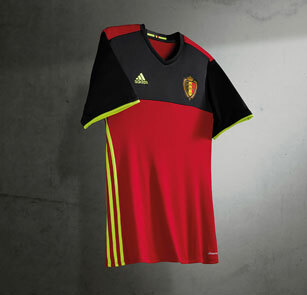 Red, black and bold, adidas are making sure that the Belgian red devils go to the Euro's in style! A mainly red shirt with black block across the chest and sleeves really grabs your attention, the addition of yellow stripes and accents makes sure you won't forget this in a hurry. Black shorts and red socks will accompany the players as they hoop to put Belgian football on the map. A bold new world for the World Champions. 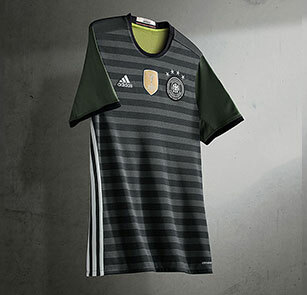 Coming into the tournament as World Champions, Germany will want to make a statement on and off the pitch, this shirt is going to do that. The Dark grey shirt with subtle black hoops and dark green sleeves really does stand out among the crowd. With white adidas stripes down the sides it is a bold move by adidas. It also features 4 stars just to rub it in that they won the World Cup. The big talking point of this shirt is that, it is reversible! The other side of this shirt is neon green and made to look like a bib. With the words "Bolzen. Kicken. Pöhlen. ", all German words which basically mean "kick about". The off white shorts and socks really are a new look for the World Champions. 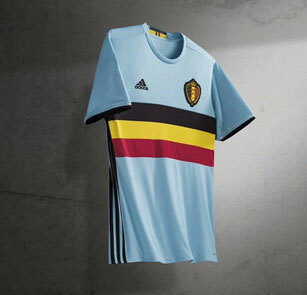 This shirt has been turning heads all over Europe, the new Belgium away shirt has a stark contrast of subtle and bold. Taking inspiration from the well known Belgian blue cycling jerseys. The light blue shirt with a the colours of Belgium across it really does set it apart from the crowd. They have been tipped as the dark horses of the Euro's and with shirts like this you may see a few around the streets soon! While Denmark's home shirt is a simple classic design. The away shirt is anything but, the white shirt with subtle grey hoops and black sleeves is an understated shirt but a joy to look at. 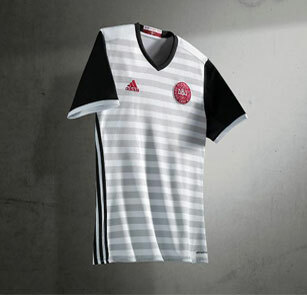 On the neckline is the Danish flag as well as the slogan "En Del af Noget Større" to promote the "A Part of Something Bigger", used by the Danish FA (DBU) in their promotion of the national team. With black shorts and white socks this really is a stunning kit and Denmark will certainly feel pride wearing something this beautiful. Do you agree? Think there are better adidas Euro 2016 shirts? Let us know what you think!